Let’s start the final month of the year with… : Nail of This Week. 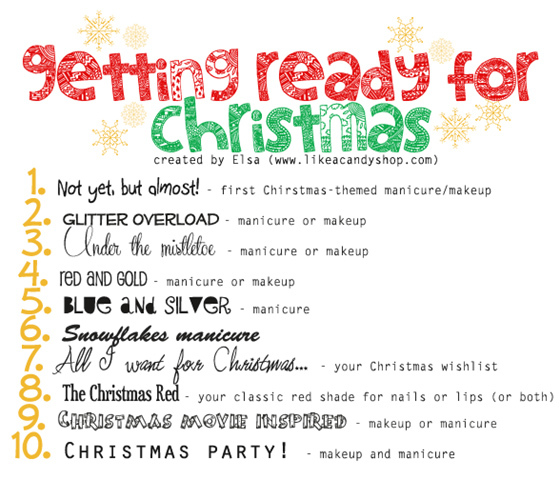 This one is created by Elsa from Like a Candy Shop, which is really lovely nail & beauty blog. Yes hers is beauty blog, so it includes makeups in some themes…but very sorry I’m NOT the one who’d like to put my face online therefore you won’t see how I looks like during this challenge :P Sorry! Anyway what I love of this challenge is lovely theme name and also its time points; Elsa didn’t set any deadlines, she even said it’s free to post whenever I want. Great! This saved my life because when I noticed this challenge it was already midnight of 29 November, which was already too late from “official” starting date that was 28 November. I'm glad I inspired you to start this! So many people have joined, it's crazy. Looking forward to seeing all your designs. On Christmas, we often spend on clothing and accessories.